Discuss the role of wood specialty ceilings in commercial buildings, including new integrated, preengineered systems. Evaluate how aesthetic choices interact with performance, safety, and durability in a broad range of standard, custom, and one-of-a-kind design options. Examine key performance attributes: acoustics, fire performance, accessibility to the plenum, seismic performance, moisture resistance, sustainability including contribution to LEED, and installation. Recognize how the manufacturing process of wood panels determines their appearance, performance, lead time, and cost. The sheer visual impact of wood means that it is often chosen as a focal point in dramatic “statement” spaces, such as corporate headquarters, research centers, performance spaces, and other signature buildings from university campuses to city halls. Wood, one of the oldest and most traditional of building materials, is now being used as the heart of some of the most inventive new designs, meeting exacting technical requirements. 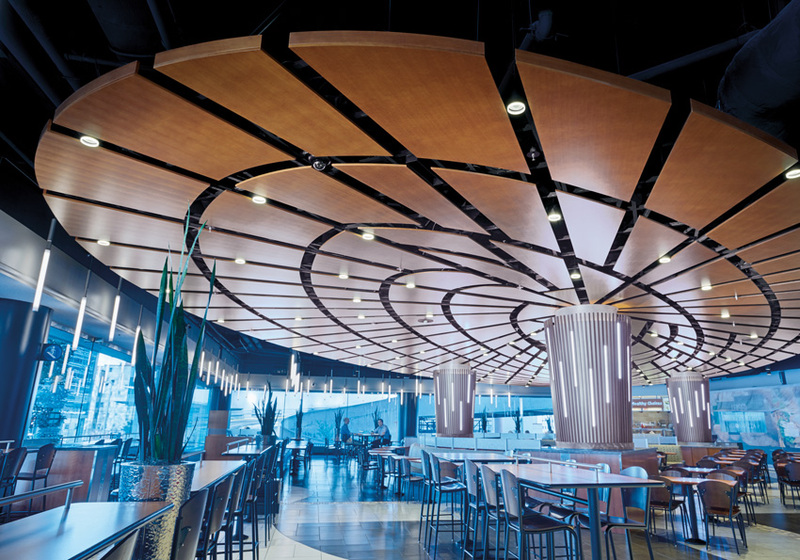 Beautiful wood ceilings are certainly not new, but traditionally, they were made by hand, and until recently, piece-by-piece custom millwork was still the primary option for specialty wood interiors, even in commercial spaces. Figure 1: Wood ceilings make powerful visual statements in focal point spaces. Acoustic, seismic, environmental, and fire performance are built into the aesthetics of the installation. Now new manufactured panels and systems make it possible to combine the design versatility and intrinsic appeal of wood with the performance, reliability, precision, durability, and cost advantage of manufactured components and systems. Almost unlimited choices in finish, form, and size are available, from various combinations of standard components to custom shapes and layouts to the creation of one-of-a-kind, entirely bespoke ceilings and walls. However, aesthetic choices in today’s systems are closely related to performance. The essential characteristics of wood and the way it is manufactured determine not only visual effects but critical aspects of performance and a long, durable service life: acoustics, fire and seismic safety, efficient access to the plenum, moisture resistance, sustainable materials, and healthy interiors. Effectively integrating these features with other elements within the ceiling and in the rest of the space is the key to delivering these benefits along with a specialty ceiling’s good looks. The earlier in the design process the architect can see the range of possibilities and understand the implications of each design and manufacturing decision, the lower the cost, the shorter the lead time, and the better the performance. 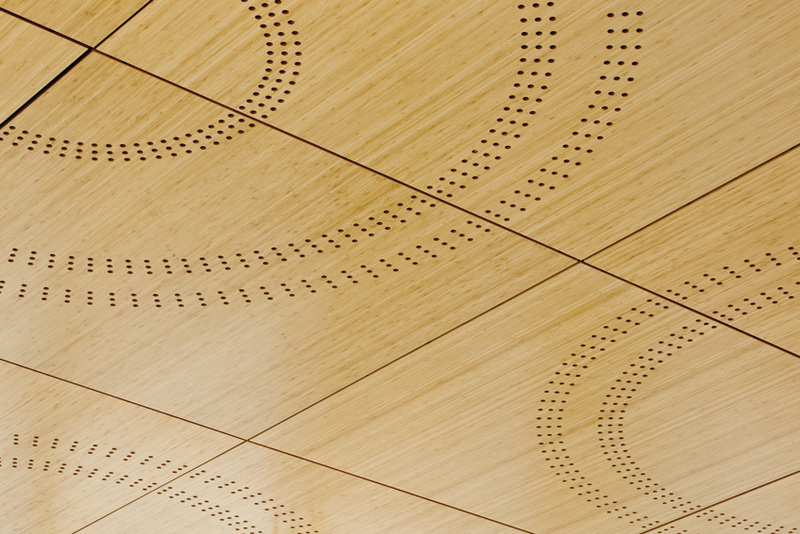 Although the design of wood specialty ceilings is highly technical in many respects, one of the primary reasons wood is chosen in many projects is more emotional: the innate connection of humans to natural materials. In this sense, the aesthetic value of wood interiors is an important performance attribute. The positive impact of wood in a person’s surroundings is used in health-care settings to emphasize calm and promote healing, in education facilities for statement spaces, in offices to reduce stress and improve concentration, and as shown in some of the examples in this course, to heighten design effects, such as adding warmth to an industrial space, bringing a sense of community to a civic space, or emphasizing aspects of the surrounding landscape. These effects are achieved through combinations of many variables in size, shape, form, finish, wood species, perforation pattern, and installation type. The following are major categories of design options, with examples of how they have been used in a range of remarkable interiors. Veneer: Thousands of species of wood can be made into veneer. Each species has a unique color, shade, and graining pattern and receives stain differently. Each individual tree is unique as well, so visual possibilities are almost unlimited. Many common species can also be stained to match more exotic, expensive, difficult-to-obtain, or environmentally sensitive species. When large quantities of a certain veneer are needed, careful attention is required to make sure different finishes match, complement, or contrast as envisioned in the design. Figure 2: The custom perforations provide visual appeal and an acoustical solution.